IOS App Developer: Tecarta, Inc. This is The Holy Inspired Word of God and it is my Bread of Life. I do my best to stand on God’s Word daily. I believe it is the Holy Inherent Word of God. 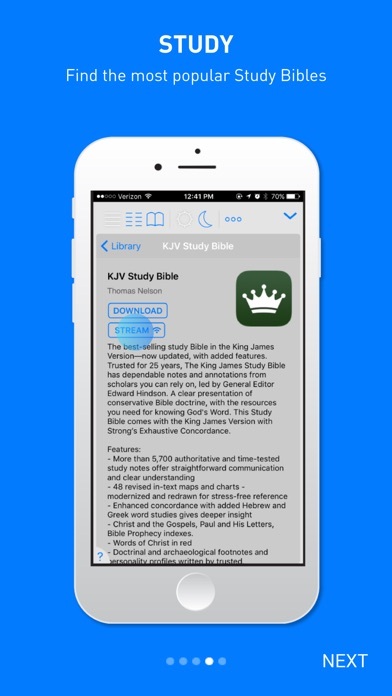 This is by far the best app ever my family and Have spiritually grown by studying and reading the word of God. I love this app! It’s so easy to use. The framework and set up keeps me from getting lost. This a wonderful app! I love the fact I can follow the speaker with any version he decides to read. I like to have KJV along with their version side by side. I'm only using that version when the speaker reads it so no need to download it. WONDERFUL!!!! 4/10/2019-I have added “study Bibles” and this has made everything so much better! The word is with me every where I go and I love love it I have this app on all of my devices! This Bible App has to be the best one I have used out of the hundreds I have tried. It is absolutely free unless you are interested in the various translations or versions. There are multiple devotional and study bibles to choose from. Love how it reads the Bible to you!!! I take things in with more understanding of reading and listening!!!! More IOS Apps by Tecarta, Inc.